Sensing victories in November, Netroots Nation activists push for Democratic unity, but on their terms. NEW ORLEANS —Tom Steyer arrived at the Marc Morial Convention Center in New Orleans ready to dish out red meat. A gathering of nearly 3,000 liberal activists for the Netroots Nation seemed the perfect audience not only to promote his drive to impeach President Donald Trump, but to take a shot or two at the establishment Democratic Party for not embracing it. Instead, an awkward silence greeted his pitch, making it easier to hear the voices of several who called out to question the billionaire hedge fund manager's approach. And it stood in contrast to the chorus of support for his grassroots organization’s efforts to win congressional seats and boost clean energy ballot initiatives this November by knocking on a quarter million doors in GOP-held congressional seats in California and registering 80,000 new voters. There seemed little doubt among those gathered this weekend that Democrats are poised to have a big November. And progressive activists are determined to press their advantage, pushing party leaders to embrace an agenda that could excite voters not just this fall but in the years ahead. 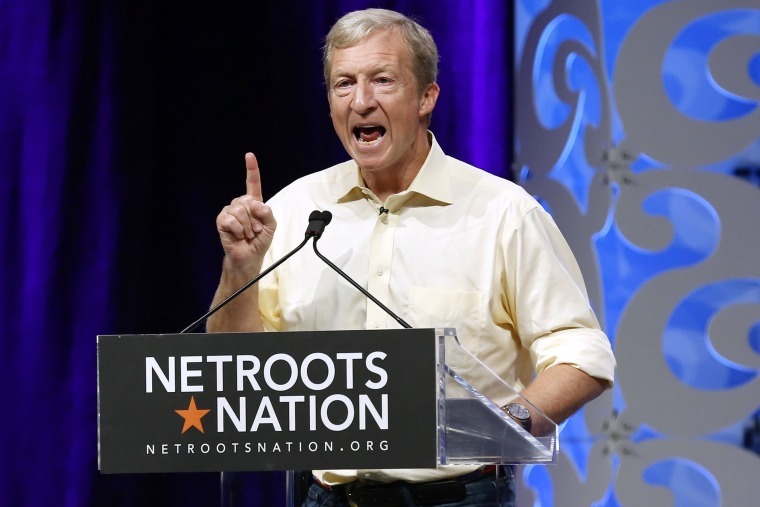 Now in its 13th year, Netroots has become one of the largest conveners of an often fractious coalition of liberal and social-justice oriented groups in a party that has never been one to fall in line easily. And so there was a striking consistency in the message from most of the featured speakers, a mix of new faces who’ve emerged on the backs of the Trump resistance and the more familiar names who will likely try and lead it against Trump in 2020. Still, organizers said they wanted to weigh in strongly on the question of just how much focus Democrats should put on winning back an independent or white working class voter who flipped from President Obama to Trump. And they closely followed a more low-key gathering sponsored by Third Way, a centrist Democratic think tank, which was full of warnings about the party following Republicans’ example of doubling down on a rabid base. The common refrain here was that the real swing voters are not those that would go from red to blue, but from non-voting to voting. And that while the Trump presidency has raised the stakes for coming elections, the pursuit of justice and economic fairness was a longer-term effort that needed to look beyond the president. A new crop of younger, largely African American mayors in deeply red states was showcased to tell their stories of how they beat back the local Democratic machine candidates with a decidedly liberal message and block-by-block organizing, and how they sought to make dramatic strides forward even in some of the reddest of states. Outside of anti-Trump crusades, what do Democrats stand for? To be sure, Trump-bashing was often a reliable applause line, even for Steyer. But the name most often igniting the nearly 3,000 attendees was Stacey Abrams, who if elected in Georgia would be the first black woman ever to serve as governor. The hidden potential of women of color in the party — as a voting bloc and as some of its most effective organizers and candidates — was a major focus both on the main stage and in nearly 100 smaller panel discussions. Sen. Kamala Harris, D-Calif., another potential 2020 hopeful, said the party must do more to honor the work African Americans have put in to building the party at all levels of government. Rep. Tim Ryan, D-Ohio, had the distinction of being the rare official who spoke at both the Netroots and Third Way events. So perhaps he more than others could speak to potential rifts ahead. “We need a bold agenda. And you know what, that’s gonna mean we gotta get in some fights,” he said. But he cast a wish-list of progressive agenda items like expanding Social Security, debt free college tuition and Medicare for all as consensus ideas the entire party can support. And even Alexandria Ocasio-Cortez, who shocked longtime New York Rep. Joe Crowley, a top House leader in the party, in a June primary, cast a unifying address even as she restated her support for Abolishing ICE and other ideas that the party establishment has resisted.